Former British prime minister Winston Churchill is featured on a new banknote alongside his famous declaration "I have nothing to offer but blood, toil, tears and sweat" (Bank of England/Courtesy Reuters). You finally land the job you have long coveted. But many of your colleagues dislike you, and the task you have been given may be undoable. That’s the situation that Winston Churchill found himself in seventy-three years ago today. He responded with a speech that is regarded as one of the greatest ever delivered in the English language—and one that helped rally his country at one of its darkest moments. Churchill was offered the prime ministership on May 10, 1940. His predecessor, Neville Chamberlain, had resigned after it became clear that he had lost the confidence of his fellow Conservative Party members. Chamberlain had championed the appeasement policy that was supposed to preserve peace in Europe. It had the opposite effect, emboldening rather than satisfying Adolf Hitler. Churchill had been a biting critic of Chamberlain’s appeasement policy, even though he too was a Conservative. Churchill’s unrelenting criticism had angered many of his fellow Tories. They were not celebrating his elevation to prime minister; some privately expected (and perhaps hoped) to see him fail. But Churchill’s domestic political difficulties paled in comparison to Britain’s foreign policy problems. The so-called Phony War that had prevailed in Europe since Germany invaded Poland the previous September had ended in April. Denmark and Norway had fallen to the Nazis. On May 10 the German army invaded France, Belgium, Luxembourg, and the Netherlands. I would say to the House as I said to ministers who have joined this government, I have nothing to offer but blood, toil, tears, and sweat. We have before us an ordeal of the most grievous kind. We have before us many, many long months of struggle and suffering. If Hollywood had staged the scene, Churchill’s defiant words would have been met with thunderous applause. But life seldom follows Hollywood scripts. Few MPs clapped. Many of Churchill’s fellow Tories grumbled. They still preferred Chamberlain. No one outside of Parliament heard the speech live; BBC reports merely summarized it. Churchill’s first radio address to the nation would not come until May 19. It would take days for word of the speech to seep out into the broader public. A version of the speech was eventually recorded for broadcast. Disagreement exists as to whether Churchill recorded the speech himself. Some experts argue that Norman Shelley, a BBC actor, taped the speech because Churchill was too busy to do it himself. Historians note that the line about “blood, toil, tears, and sweat” wasn’t entirely original. Churchill likely took it from Giuseppe Garibaldi, the nineteenth century Italian revolutionary who once rallied his troops by saying he could only offer them “hunger, forced marches, battles and death.” But genius often lies in borrowing from the past and reinventing it for today. That gift may be why Churchill remains the only politician ever to win the Nobel Prize in Literature. Churchill’s promise that he could offer only “blood, toil, tears, and sweat” was sadly accurate. As he was speaking, the German army was crossing the River Meuse into Sedan. France fell just six weeks later. With the United States still clinging to its neutrality, Britain was left to battle Nazi Germany alone. In the Battle of Britain that lasted throughout the summer of 1940, the Luftwaffe devastated many British cities. Blood and tears flowed freely. But Britain survived its darkest hour, in good part because of Churchill’s determination. 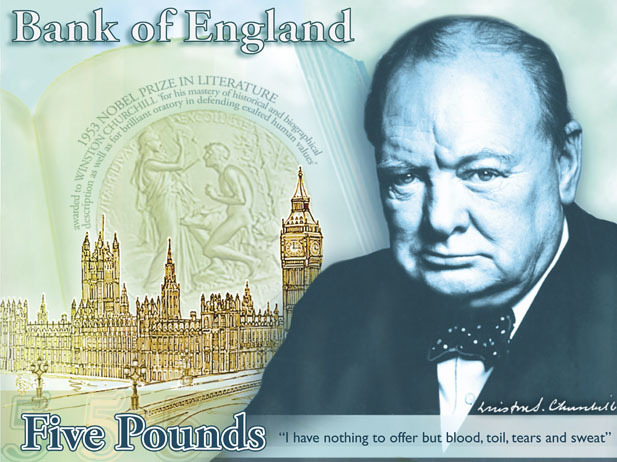 So it is fitting that last month the Bank of England announced that the “blood, toil, tears and sweat” quote will appear alongside the portrait of Winston Churchill on Britain’s new five pound notes.